Lilabelle Lane: Cut or not to cut? One of the items in my UFO / Accountability Challenge is a quilt top that I have described as "half completed". Here in lies my problem/dilemma/indecision. It needs a good iron and some boarders. some flowers etc to be embroidered on. Do I just finish off my quilt ... add a boarder, finish the embroidery etc? 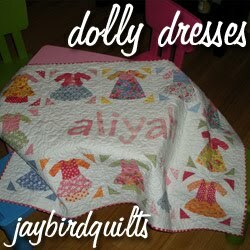 Do I cut it up and make the "Dolly Dresses" quilt pictured above? Also, if you are interested in the pattern for the "Dolly Dresses"
I like yours the way it is. If you want to add a name, perhaps it could be included in the border? Some many quilts, so little time. Yours is adorable. Maybe a little white border and scrappy binding. It's worth finishing. Good luck. I like yours better! Just add a border. I like the squares white, gives a clean look. But don't cut it up! That's just more work. I agree with everyone else, I love your quilt as it is, it's very pretty. I look forward to seeing it finished. Oh do not cut that quilt, you might even add a border of more of the four patches all the way around. It is gorgeous.